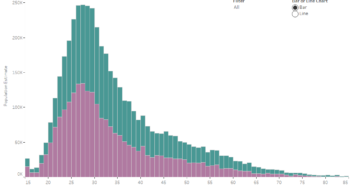 I was interested in visualizing how the highest level of school completed differs based on someone’s age. To do this I gathered data from the American Community Survey which is completed by the US Census Bureau. I used the 2015 One Year Estimates Public Use Microdata Sample, which can be found on the ACS Website. I then used Tableau to visualize the data. 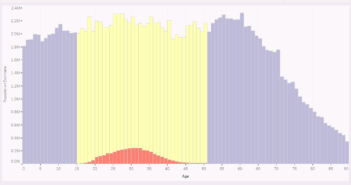 If you are interested in more data like this be sure to check out my “How American’s Differ by Age” Data Visualization. 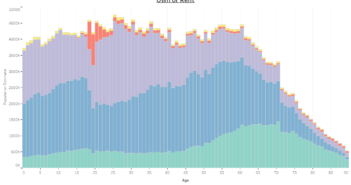 The visual is pretty flawed because it shows education graphed by population and as people age, they die. It makes sense the oldest on this chart show the smallest bars. The only way to get something of use out of this to hover over the colors and see the data by PERCENTAGE of living members of that age… that IS interesting and shows what you would expect that the oldest Americans DO tend to have less formal education than younger Americans, but it isn’t overwhelming, in many cases only 5-10% less for each category of education.